The second thing I did, while continuing developing relationships in the communities, was to focus in on connecting with the employment agencies in the communities from which we were going to hire. I simply contacted the Rawlins and Riverton Wyoming Department of Workforce Service offices and set up face to face meetings with the respective directors. I also met with the regional director so that she understood our employment needs and could help. I met up with these good folks many times throughout the process either by dropping in on them when I was in town or when I was attending the same community meetings they were also attending. I also kept them in the loop by sending them copies of our news releases so they could more easily monitor our progress as we went through the permitting process. This effort established trust and credibility in me with the folks at the employment agencies which was very valuable when we officially launched our hiring efforts. As an extra bonus, I can call these people friends! In the fall of 2012, I was ‘officially’ tasked with developing a strategy for recruiting and staffing our newly licensed uranium mine located in south central Wyoming. When I say ‘officially’ I mean it was time to launch the strategy I had been developing and working on for several years. I actually started developing the recruiting and hiring strategy a few years prior to my having to launch it. We had been working on the permitting and licensing of the mine for several years but did not know exactly when we were going to receive the final set of permits that would allow us to start the construction and operation activities. So with the luxury of time, I set out. The first thing I did was make connections with people in the communities where our employee base would be located. In this case, Rawlins, Bairoil, Wamsutter, Riverton, and Lander. I focused most of my attention on Rawlins, Bairoil and Wamsutter because those communities are 45 to 15 minutes away from the mine site while Riverton and Lander are a little over an hour away. I started the process of connecting with the economic development organizations in Rawlins by learning when they held their meetings and attended them. I made sure I looked the part by arriving in Rawlins in the white company Ford F-150 with Wyoming plates (bad form showing up in Wyoming as a “greenie” with green Colorado plates!) and wearing a company shirt and my Wranglers and roper boots. The Rawlins community is a small Wyoming town with the majority of the population employed in the extractive industries and are predominately hard working blue collar. It’s important to be deferential and try to fit in and not come off as a big shot big city type coming in to save them. When attending these meetings, I simply introduced myself to everybody I could and explained who I was and what my company’s future hiring plans were. This, of course, generated a very positive reaction leading the people I met to introduce me to other local influential officials. I soon built up a solid network of influential people in Rawlins, Bairoil, and Wamsutter and kept in touch with them by sending them press releases of our progress, emailing them with company updates, and making presentations at city council and annual local “roundtable” meetings. In addition to attending these meetings, I made a lot of phone calls and knocked on a lot of office doors. This effort introduced me to a lot of people who would later help with my recruiting efforts and with gathering public support for the company. I also made a lot of new friends. I was able to build a level trust with the influencers in the communities. This was important because they have lived through many “boom and bust” periods where companies swept in with big promises and swept out when things got tough, leaving the communities holding the bag for the infrastructure costs they incurred to accommodate the influx of employees. Initially connecting with the communities established the critical foundation for the next steps in the strategy for staffing the mine. Steps I will cover in a series of future posts. Over the past two months, I’ve been travelling to several Wyoming communities recruiting for positions to staff my company’s mine. 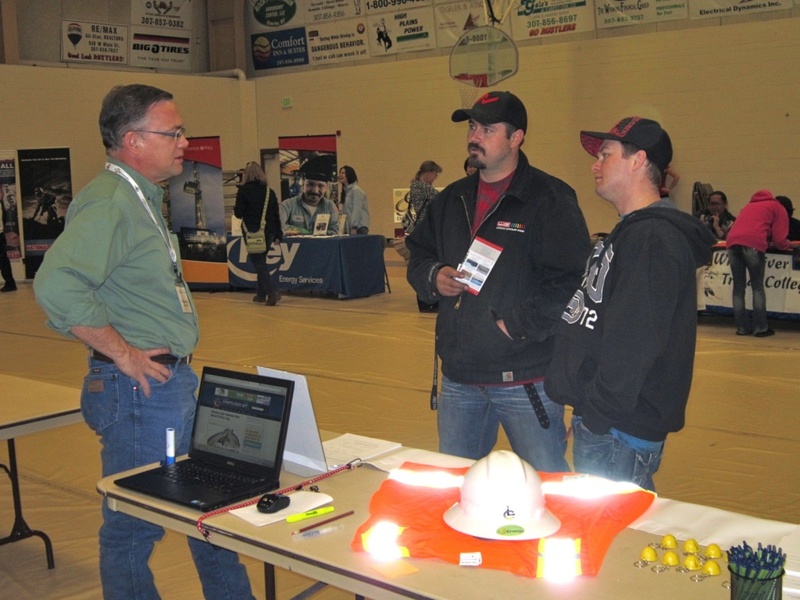 While working various job fairs and in speaking with hundreds of candidates, I was reminded that recruiting in the mining industry is very different than recruiting in most other industries. There are not many people, if there is any at all, out there talking about the nitty gritty of recruiting in the industry. Most of the focus in the main stream media, blogs, podcasts, books, magazines, and conferences centers on the latest technology and mostly on professionals and knowledge workers. While I find it all very interesting, it has nothing to do with the kind of recruiting I am doing. As a result, I coined a phrase “Hard Hat Recruiting” to describe my work recruiting employees in the mining industry. Hard Hat Recruiting is very different – not any better or any worse, mind you – than the typical type of recruiting most HR professionals and recruiters are accustomed to doing. Its an entirely different mindset and if you are going to be successful, you need to understand that mindset and not try to make these solid, decent, hardworking people fit into the mold of what conventional wisdom tells us a candidate should be or do. For example, there are no suits and ties (or even khakis and collared shirts), resume’s are spotty at best, and social media recruiting – LOL, your kidding, right?! I am starting another series of posts exploring my experiences and recommendations in the practice of Hard Hat Recruiting.